WELL VERSED: "I’ve been capturing my family’s story and history in my work because I feel I have a responsibility to tell these stories," admits Graham. Admirers like Dr. Michael Bucknor hail her as “one of the most striking new voices” on the Jamaican literary scene. But, in her own words, Yashika Graham – artist, thinker, student, muse – is just a simple country girl who relishes life’s simple pleasures. And she’s a remarkable poetess, who’s won gold in the JCDC-sponsored National Creative Writing Competition and read her work for audiences in Panama, Venezuela, the United States and Britain. The long-reigning ‘queen’ of the Poetry Society of Jamaica, Graham’s debut collection, Directions from the Border, is on the way and has been preceded by an award-winning short film of the same title. On Sunday morning, the dreadlocked truth-teller and Westmoreland native (now 29) was among four writers serving up a literary feast at Love Affair with Literature, inside UWI Mona’s Neville Hall Lecture Theatre. She spoke with TALLAWAH. TALLAWAH: Your reading this morning delivered poems laced with such alluring imagery and snapshots of idyllic ‘country’ life in Jamaica. How do you define yourself as an artist? Yashika Graham: I always try to capture experiences and moments in my work and elaborate on those experiences. That’s how I’ve always approached the creative space. I also enjoy the simple things. TALLAWAH: It shows. Lorna Goodison describes poetry as “an intrusive tyrant” that has held her captive her whole life. What say you? Yashika Graham: (Laughs). That’s very telling. I can appreciate that. Poetry is truly something that stays with you, so I’m always creating, finding different experiences worth writing about. It rests with you, and it calls the poems out of you. TALLAWAH: Your debut anthology, Directions from the Border, is avidly anticipated. What do you hope readers take away from it? Yashika Graham: I hope they each take away from it what they will. Different people will come to it and take away from it based on what they’re looking for. But I hope in reading it they all have a journey. 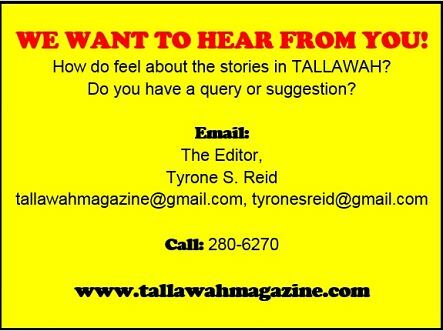 TALLAWAH: What inspires you? What’s your writing life like? Yashika Graham: I think everything is inspiring and moving in some way. Like I said, sometimes the poems find root in simple things and the attempt to capture certain experiences. For the last few years, I’ve been capturing my family’s story and history in my work because I feel I have a responsibility to tell these stories. So that’s chiefly my journey now. TALLAWAH: The Poetry Society turns 29 this year. Are you satisfied with its evolution and the role it continues to play? Yashika Graham: I think it’s still an important space. It’s been there and continues to function as it should. But there’s lots more we want to do and to improve on this literary space and how we function there. So even though the duration has been constant, there’s lots more to bring to the movement. TALLAWAH: Do you think this government, after a year in office, is doing enough to advance the arts in Jamaica? Yashika Graham: I always feel that not enough is being done. The perception is there that the arts is for entertainment, and as a society we pander to business and largely ignore the arts. Art is a big part of who we are, but sufficient encouragement is not there. We should be encouraging more people to participate in the arts and emphasizing the benefits of being an artist. Many of our artists have to have something on the side to survive. So there has to be a mindset change along with measures being put in place to boost the arts. Because art is essential. TALLAWAH: That aside, what would you say is the biggest challenge facing today’s generation of young Jamaicans? Yashika Graham: Perhaps self-definition, figuring out who we are and what we want to do. Figuring out that space is a challenge, finding your path. Yes, there is fear and doubt, but it is important to try. It’s very important to make an effort, especially if it is something that you love. You can fail but that’s not the end. You can learn from the experience, improve and grow. But I think supporting young people is also very important. Sometimes what makes the difference between success and failure is a little encouragement, that push. TALLAWAH: Finally, as an artist and a woman, what are you most looking forward to for the rest of the year and beyond? Yashika Graham: I’m looking forward to starting my degree programme at UWI in September (Laughs). I’ll be studying literature for the first time. And I’m looking forward to the book, and just growing and developing as an artist.